My readers may have noticed my absence during these past months. Moving and renovating have taken a toll. I am in this house 10 months and my kitchen is still not finished. Sigh! Good things are worth waiting for. So what have I been up to? My goal has always been to make kosher cooking easy and user friendly, to demonstrate cooking techniques with videos. I wanted to teach the traditions of my grandmother, mother and aunts to the younger women in our family and community. But I also wanted to appeal to younger cooks, those who use apps and their iPads to find recipes. Hence the release of Sarina’s Sephardic Cuisine cooking app last year. Ever since releasing the app, my friends and relatives have pushed me to release a cookbook. Yes, my background is Syrian and of course, the recipes I know and love are those handed down in my family. And of course, I have adapted my cooking to more modern thinking about healthy eating. In thinking about writing a cookbook, I was overwhelmed by the kitchen testing, the photography and the sheer size of the project. I have written thousands of articles, newsletters, but a 200 plus recipe book? The work and time commitment seemed too much. When I examined other Jewish or kosher cookbooks written, I saw beautiful pictures or not pictures. I saw coffee table books. I did not see user-friendly books that I would actually use in the kitchen. I did not want to put work into a book people would not use. Last year, I attended a Jewish blogger’s conference and several publishers were there. Bloggers got to pitch ideas to the publishers and I saw that the only ones of interest were themed cookbooks, similar to the ones I liked using. I thought about the kosher cookbooks I liked to use. While I don’t use cookbooks often, I do have some favorites. They are all small, almost pamphlets, and most are based on a theme like cookies, muffins, breads, salads, and pastas. I like them because they are easy to use, fit easily on my counter when cooking and are lightweight. 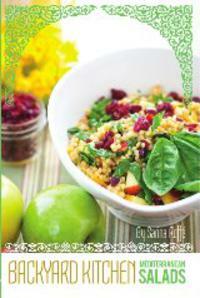 So Sarina’s Sephardic Cuisine is in the process of producing a series of lightweight, easy to use, themed cookbooks. My first – Backyard Kitchen: Mediterranean Salads - was released this week on Amazon. 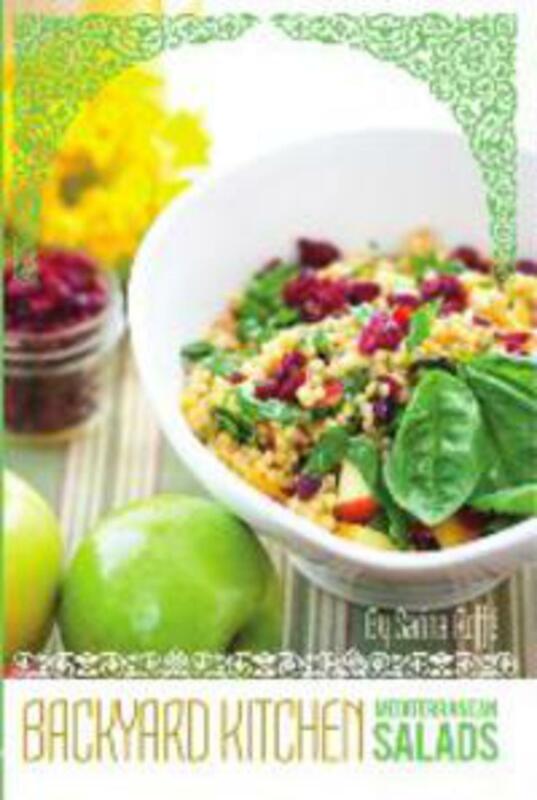 The book is limited to salads, couscous and pickle recipes. I decided on salads because it always seems I am making and creating new ones. Healthy eaters are always looking to find new salads. Vegetarian cuisine is popular and it seemed like a good first start. I am thankful to Karen Erani, Polly Earl and Penny Hakim, my dear friends, as well as my family, for their editing. I love the professional photography by Michele Dayan. I am awed by Elliot Chrem and his ability to style the food. And I am ecstatic about the graphic art of Ruby Buckris. Ruby understood my desire to have a book with a Mediterranean theme, one that conveyed my Middle Eastern culture. It was Ruby who thought of title Backyard Kitchen, after reading my work and learning that it was where my grandmother Esther Salem had her catering business. My Sito was a powerful force in my life. The images of her, her home, her shopping and her cooking play over and over in my head. I am often reminded of walking up the side alley of her house on 63rd Street, of watching her take the large trays of food come of the large ovens, the smell of bisset (roasted seeds), or of just sitting with her to learn how to shape a kibbeh. I remember her catering business and how she supportd a large family when my grandfather Selim did young. I loved her short stature, and how she opened the chest freezer, and almost fell in to retrieve or store food. I remember how she went to the beauty parlor very Friday and how she sat looking out the front window, her tea in a glass, on Saturday afternoons. I remember her house in great detail. I remember the Sunday afternoons when all my aunts and uncles and cousins went to her house because ‘Uncle Maxie is coming’ (he lived in Bayside). I dedicated Backyard Kitchen: Mediterranean Salads to Sito. Enjoy. It’s a winner.